I’ve been journaling quite extensively for a year. I wanted to share my workflow and how journaling has affected my life. In short, journaling has made a more complete and rounded me, but it has taken an immense amount of focus and determination to complete. Undoubtedly, it has been effort well spent. But much effort has been spent. I arrived at the discussion table for a meeting the other night and I casually threw my Field Notes memo book and pen on the table in front of me. The meeting proceeded and, as any journaler or notetaker does, I began scratching notes and thoughts into my Field Notes. Anything of importance was swiftly applied to paper for safekeeping. Of course, as if some 23 year old punk sitting at the meeting table wasn’t enough to draw attention to myself, the notetaking must have caused some stir. After a half hour, the first joke about my diary was cracked. Then another. Then a third. I’ve become used to the wisecracks after a year. What’s odd is the admittance of keeping a diary. Diaries are for secrets, right? They are for our deepest, darkest thoughts — thoughts of secret loves in high school; rash emotions of fear and desire when swayed off our feet; and awestruck words only our own eyes can read. This is so wrong. So bloody wrong. In so many ways. And even the internet can’t get the two terms straight. I read through 20 different articles to gain better traction on why there are two separate terms and why one of those terms has an attached stigma. Each article contradicted the next. 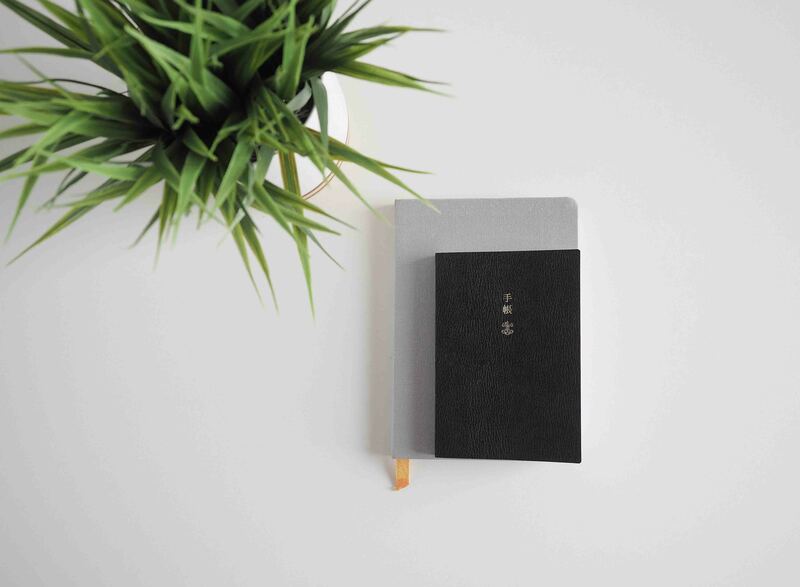 For the most part, diaries appear to be a physical book in which one records daily observations and events. Journals appear to encompass a broader range than just personal happenings, such as technical logs or scientific periodicals. In the end, it’s all pish posh jargon. By definition I suppose, the wisecracks at the meeting table were correct: I keep a diary. Yep. I keep a diary. In a way, I may keep a journal also. But who cares. What matters is that it has changed my life. Recording, recognizing, and signifying important events in the past year has improved my memory and my realism. Pushing the tidal waves of thought and emotion through the nib and onto paper has created a metaphorical bottleneck — my recorded thoughts now have structure, my daily doings now have amplified importance. I also feel my diary/journal has helped me identify the passage of time in an entirely new way. I’ve learnt how one third of each day can affect the other two thirds significantly. I’ve learnt to schedule, to capture, to retain, and to spend time efficiently. If not for my diary/journal, I couldn’t properly navigate through full-time employment, full-time accountancy school, two part-time jobs, and volunteer work. And I certainly wouldn’t have any apprecation for this time period of my life. 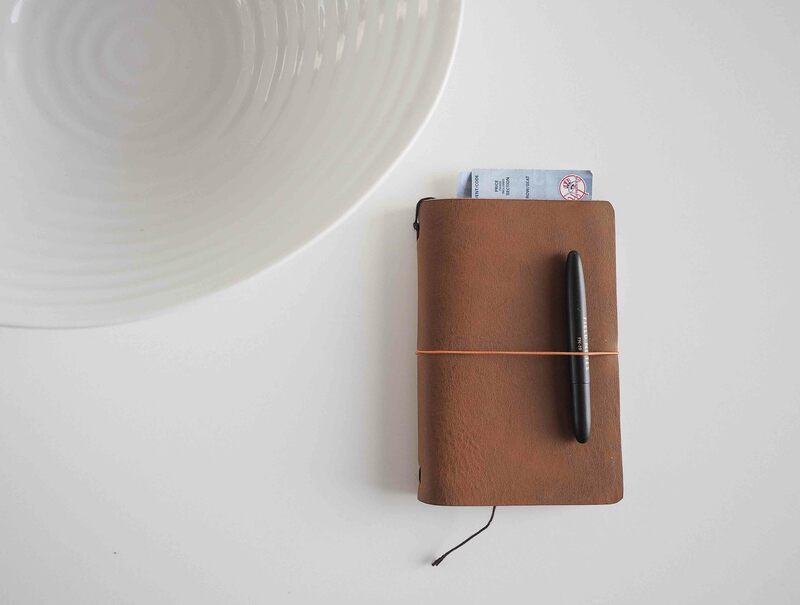 Whether it be a diary or a journal, your life can be profoundly altered by the self-discipline of recording and formulating thoughts into structured language. And if you can’t choose which to keep, try both. Then try keeping both. See what you think. 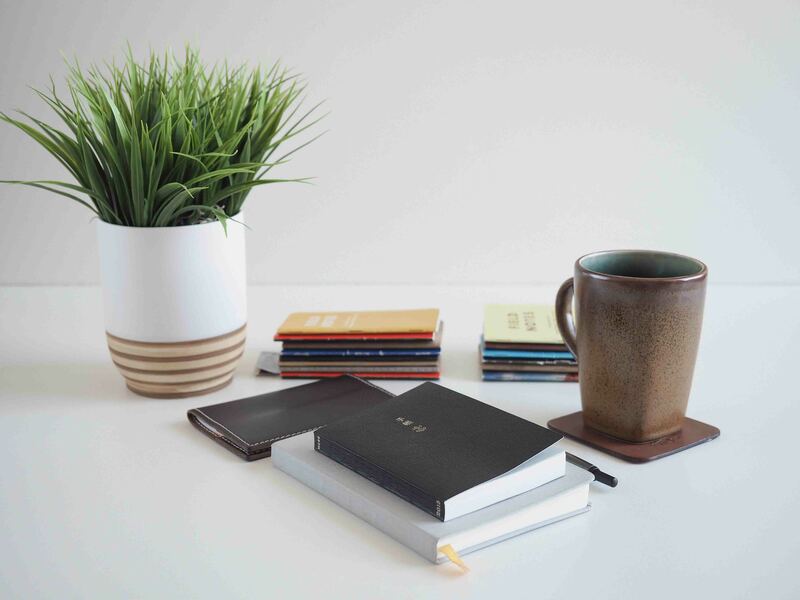 When devising my diary plan a year ago, I came up with what I called the Hybrid Journal.1 Thoughts go through our minds at any and all times of the day — when drinking the first cup of freshly brewed coffee, or when laying your newborn into his or her crib. What good is a diary that can’t be easily carried in these situations? I can’t fathom carrying a full-size Moleskine around with me wherever I go. So I use Field Notes books. The magical 3.5” by 5.5” standard memo book size has been essential to my recording. 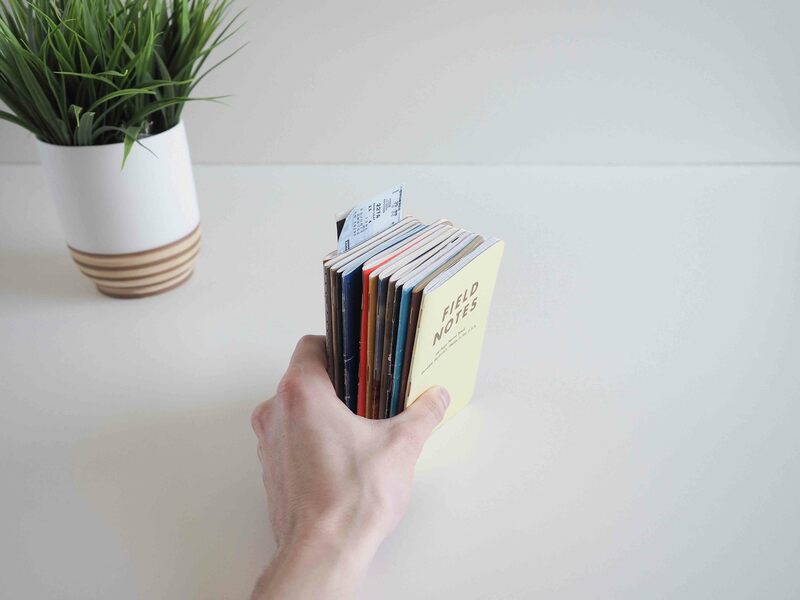 The physical dimensions of the book can be easily slipped into a back pocket or jacket pocket. 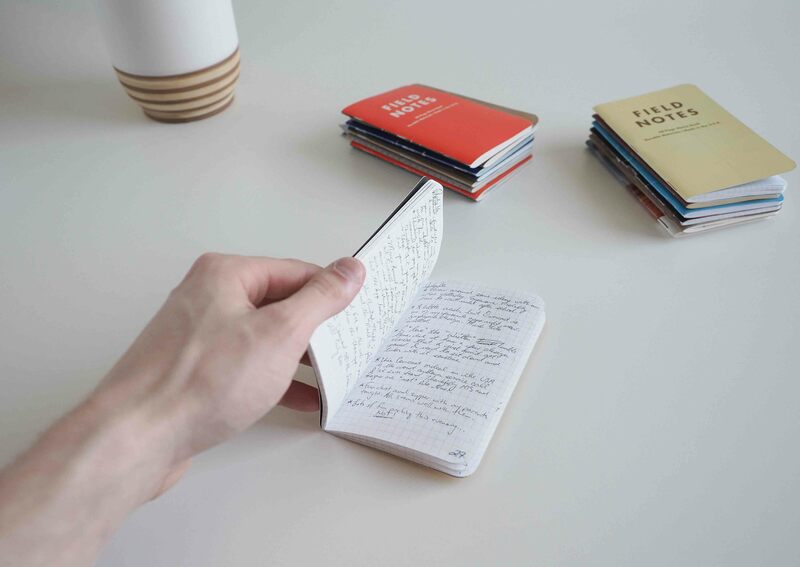 But there are a few other — more psychological — reasons why Field Notes books are, in my opinion, the ultimate diary inbox. Writing in the same book every day is a friction which works against the flow of ideas and thoughts. Upon first crack open, Moleskine journals are beautiful, simple, and ultimately utilitarian. But work your way through half of one and try not to be dissatisfied with the inspiration imbued from the book. 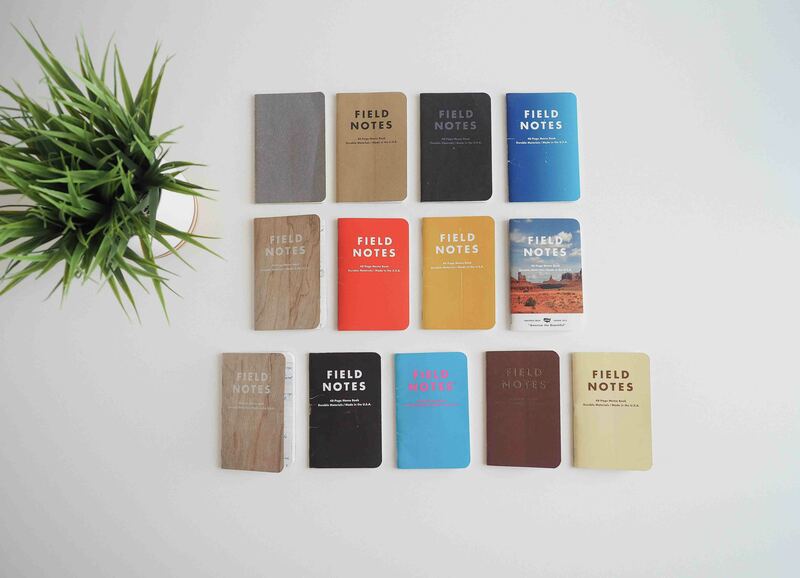 Field Notes have (in Brad Dowdy’s words) it. And they have it in so many different ways. From colours, to paper types, to satirical messages, to delicious themes, Field Notes memo books inspire pen and paper contact. They are made to be used, beaten, and torn. 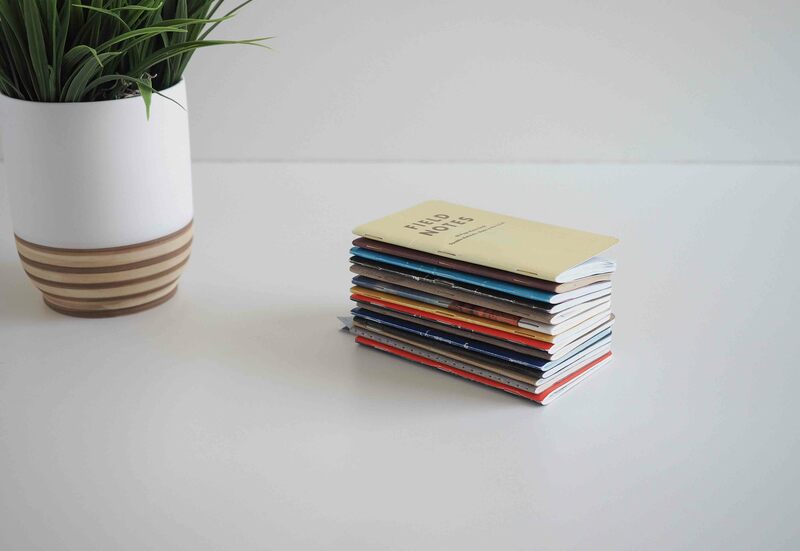 And they are the perfect diary inbox. I carry one of these memo books with me wherever I go. Usually it’s in my back pocket encased in a DDC Stuff Sheath or Hellbrand Leatherworks cover. I like using a cover to keep my books from being utterly destroyed, but the beauty of a taped-together Field Notes is a sight for sore eyes. 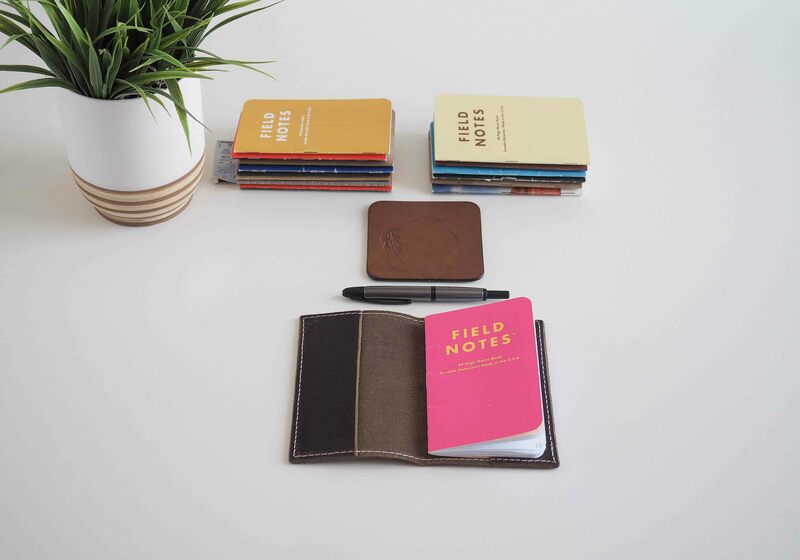 However you carry your Field Notes is irrelevant. Just carry the book. Wherever you go. The other half of the pen/paper tandem has been far more difficult to nail down. I started my year of journaling with a Fisher Bullet Space Pen and numerous Zebra Pens, only to become absolutely entranced with fountain pens, inks, and nibs. For the same psychological qualities instilled by unique Field Notes books, I have settled on fountain pens for my recording needs. Ballpoints lack the character and the zeal necessary to keep an inspired journal or diary. The flow of true ink — not the garbage found in a disposable pen — into the fibers of the paper brings the writing a little closer to home. Increasing the passion and decreasing the friction, I believe, is the key to lengthy journal habits. For me, fountain pens do the trick. I’ve settled on the Pilot Vanishing Point after a year of trial and error. I adore the modern appeal of the TWSBI 580AL and the way in which ink sloshes around in its transparent chamber. But my TWSBI has been an extensive slew of problems. Unscrewing the pen with the accompanying wrench resulted in the most angersome pen cleaning of my life, and after a few months, the nib unit began to leak ink. I grew tired of the TWSBI and its problems. While I’m sure the problems are more reflective of the operator than the tool itself, I have found considerable relief in a new fountain pen. I won’t deny my inexperience with fountain pens, but I’d be surprised if a pen could impress me more than the Vanishing Point. The Vanishing Point is a fabulous writer. It’s durable. Its design is impeccable. It’s so easy to open, to clean, and to refill. And it retracts. Come on — a fountain pen that can retract? 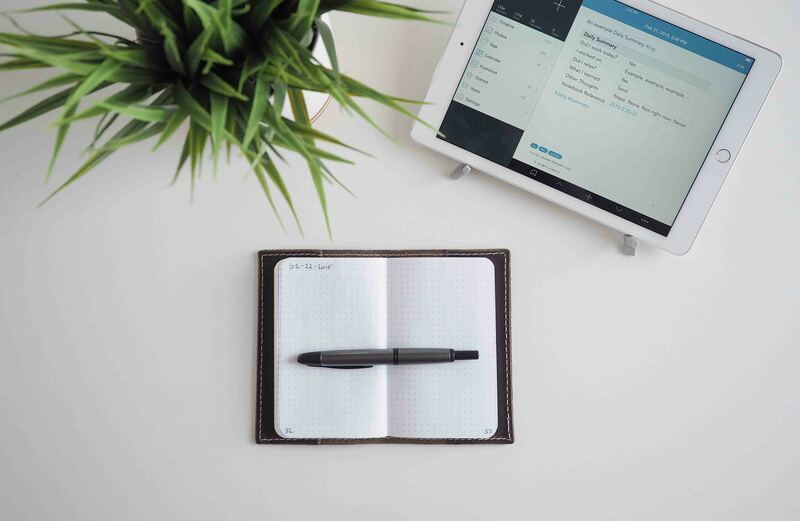 It’s the perfect diary pen; from inspiration, to great feel, to true ink, and to widespread usability, the Pilot Vanishing Point has everything I’ve been looking for to aid my journaling workflow. In my 12 months of journaling, I used 13 Field Notes books.2 In those 13 Field Notes books, I kept lists, thoughts, scribblings, scratchings, diagrams, drawings, doodlings, and quick arithmetic. Not once did I keep some thoughts out of a memo book for the sake of uniformity. In fact, uniformity is another major barrier to the Field Notes inbox workflow I’ve developed over time. I found the more I thought about organization, the less I put into my books. I use only minimal markings and organization tactics for reference purposes. I date the first line of each page and make sure to mark down a page number in the bottom corner. I also like to mark the year and the book’s annual number in the inside front cover’s “Pertinent Coordinates” section. I am currently using book 2015-2 and I can’t wait to start 2015-3. From there, I use Patrick Rhone’s Dash/Plus system to denote different types of information. Mostly, I stick to using a star to denote a journal entry, but there are odd tasks which get jotted into my books and which get “plussed” out when I have completed them. I also tend to circle any dashes that denote a piece of important information or a specific event that happened on a specific day. Lastly, I keep an index on the back page of each book. The index gets filled with the most important lists, most important dates, and most important events. Overall, the organization of my Field Notes books is simple and fairly straightforward. The more “extra” added, the more difficult the capture of thoughts and ideas. The Field Notes portion of my diary workflow is marked by frictionless notetaking and recording. If there’s friction, the workflow won’t work. You can count on that. 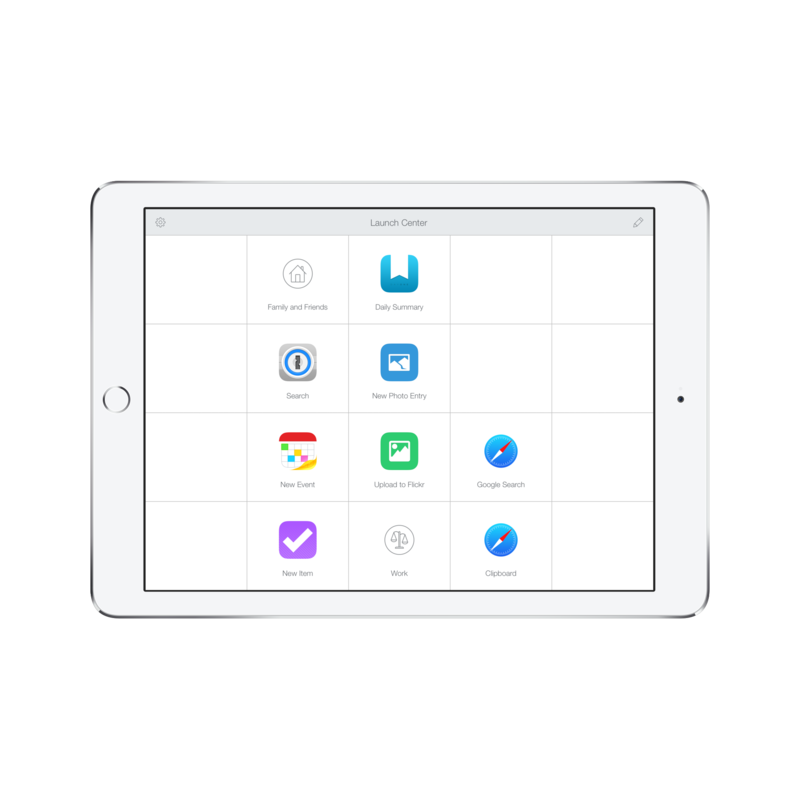 Keeping this whole process searchable is a necessity, so my pal Josiah developed some Launch Center Pro actions to help me out. 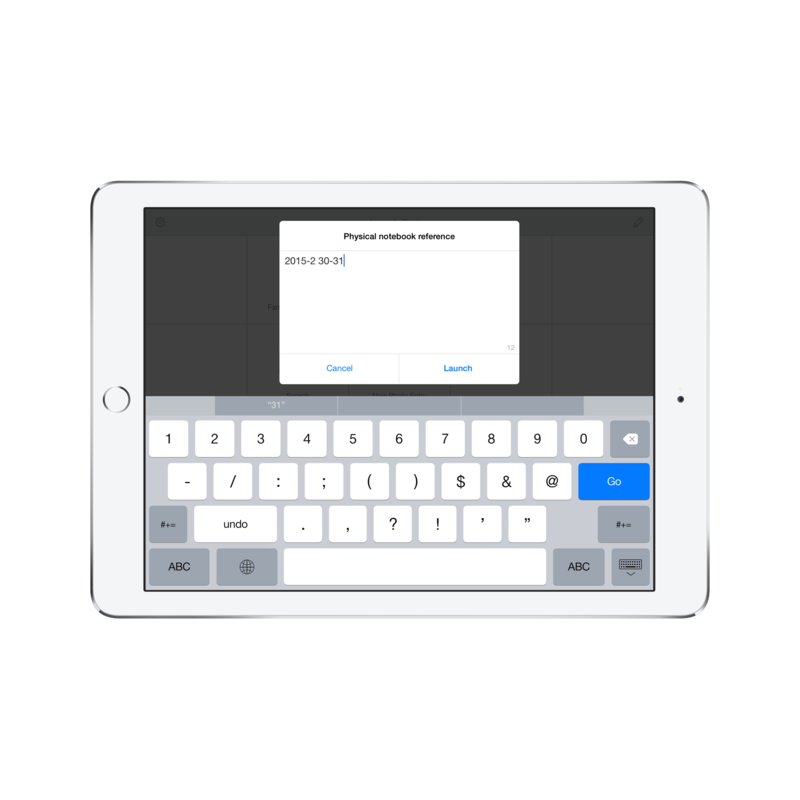 Josiah has created some extensive actions to best take advantage of Day One and its digital journal features. What did I work on? Do I have any other thoughts? I generally give these questions a quick answer, although sometimes the question demands a more thorough statement. If my day had a theme, or if I noted anything of importance, I add it in the answers to these simple questions. I also try to include major thoughts that may have potential to be searched in the future. By completing this survey at the end of each day, and by inputing some of my major written notes into Day One, I essentially have the benefits of a written journal and a digital journal all rolled into one. Via Day One, I can keep track of my photos, locations, or links, and I can achieve all the memory benefits of writing with a pen and paper. 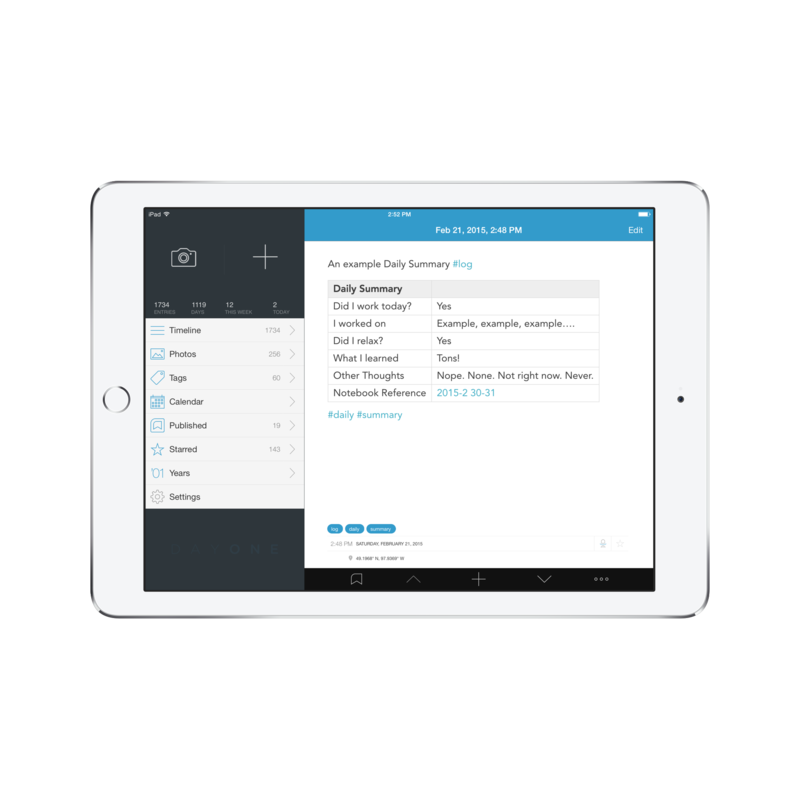 The last question of the mini Launch Center Pro survey is a “Physical Notebook Reference” which helps to tie everything together. As noted earlier, I date the top of each page and put a page number in the bottom corner of my Field Notes books. I also number each book with its commencing year and its annual book number. So each night, I round out my daily summary with a “2015-2 33-36” or something along those lines. 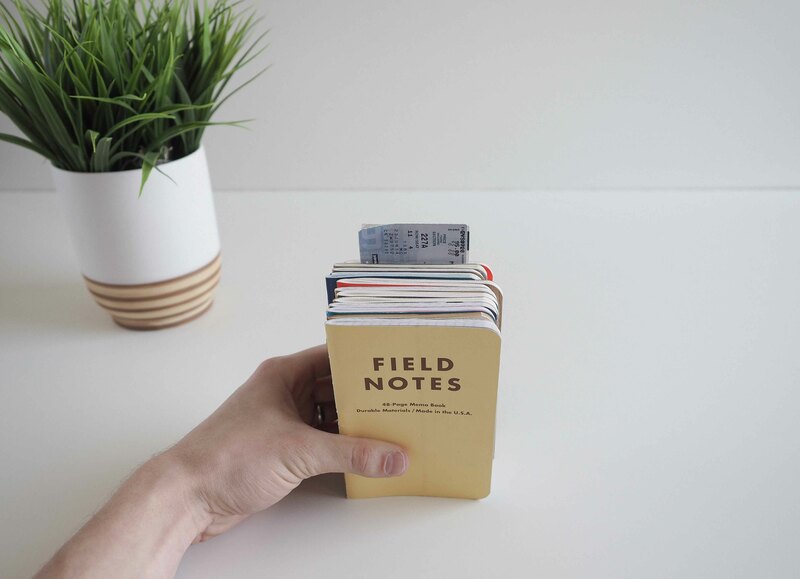 By referencing a physical book, I can quickly scroll through photos, locations, links, and daily summaries in my Day One, and I can also quickly find written notes for that specific day in my Field Notes archive. This system isn’t bulletproof just yet, as I believe OCR and scanned Field Notes pages would be ideal. However, for the time and effort involved, this hasn’t been too bad. By no means is this daily summary a breeze. I actually find I dread taking this survey before bed each night. Long days often end with extremely heavy eyes and the last thing I want to do before falling asleep is answer a couple dumb questions. Luckily, after a year, something feels off if I haven’t completed the survey. It took a long time to get to that point though. 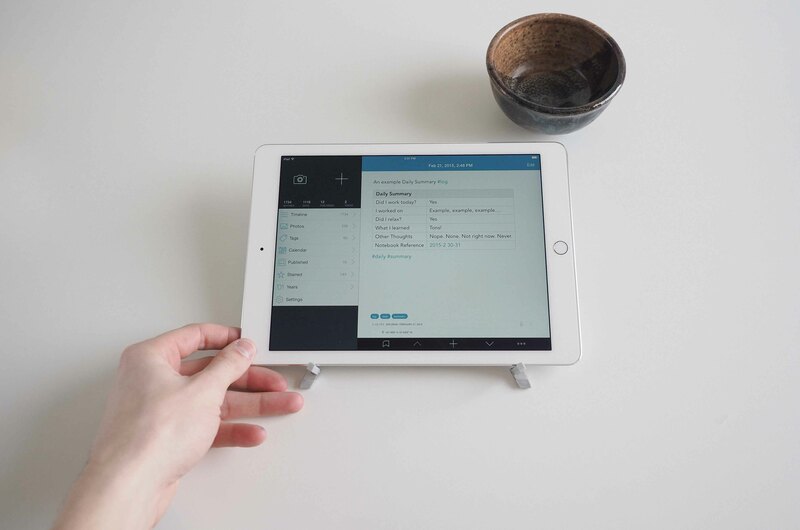 The last major feature of keeping a digital index of daily summaries is the potential for combining the digital and analog portions of this journaling process down the road. Day One has an awesome feature which exports all your entries and photographs into one gigantic PDF. Some people have even created books this way. 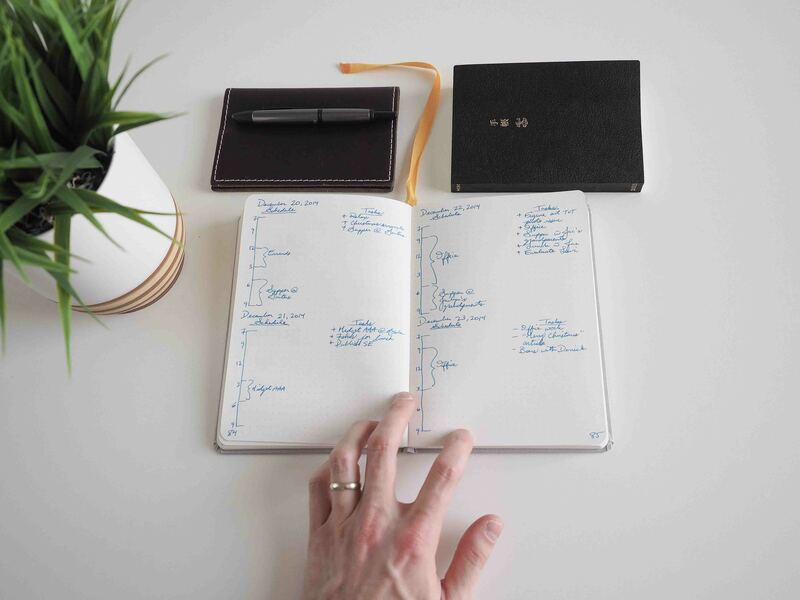 By creating a big PDF and printing that document, I can essentially combine my Field Notes books with a backed-up, paper format of my Day One digital journal. The flexibility in this process is handy and I plan to print out my last year’s worth of Day One entries to accompany the Field Notes books in my archive. If my Field Notes books enshrine the “diary” portion of this process, and if the Day One/Launch Center Pro daily summaries embody the “index” portion, then my Hobonichi and Confidant are the “journal” sections. I began the third component of this workflow right before my wife and I left for New York in July last summer. I received a Baron Fig Confidant in the mail the day we left and I quickly threw it in my bag before walking out the door. I logged each day of our trip and was able to reference my recordings for my blog posts when we returned home. Logging the journal section has been easy, but it’s perhaps the most time consuming part of the process. Logging the day is where the self-discipline of this entire workflow comes into play as well. Jotting thoughts and ideas into a Field Notes throughout the day is easy enough and the daily summary survey is fairly quick and painless to fill out. But finishing up a scheduled log at the end of each day is tiring and sort of boring. On the other hand, it’s extremely reflective in nature. When I sit down at my writing table around 9:00 in the evening, I have to dig into each corner of my brain to remember what I did, where I did, how I did it, and who I did it with. All of this calls for considerable reflection on personal productivity and, conversely, relaxation. On the left side of each day, I draw out a schedule in much the same fashion as Benjamin Franklin’s agenda of old. Thinking chronologically helps to create a roadmap and is the most efficient way for me to make use of each minute. In the Baron Fig, I divided each page into two separate days as the book was far bigger than my current Hobonichi Techo. Both have the exact same format though. On the right side of the page, I finish a list of the major tasks I completed during the day. When this list gets long, I know I’ve had a productive day. When the list is short, I know I’ve had a relaxing day. I love the effect this has on my mind, as I really cannot lose no matter what I do each day. In the same manner as pens and paper create emotional and positive psychological effects on my daily diary, so too does my daily log give me a sense of positivity at the end of each day. This has been a pretty extensive look at what a year’s worth of journaling/diarying/logging has taught me. The practice of writing for your current and future self has its ups and downs. Undoubtedly, the high time arises when looking back at past travel experiences or the brilliant entrepreneurial idea you had as 20 year old. But those high times are coupled with surprisingly extreme self-discipline lessons and rigorous thought. The mind is a muscle which needs to be flexed. It needs exercise and rest just like — and even perhaps more — than any other part of our body. In this respect, journaling is hard on the mind. It pushes the mind to explore deeper trains of thought and it stresses consideration of new ideas and concepts. So with that said, how can writing for yourself not be beneficial? 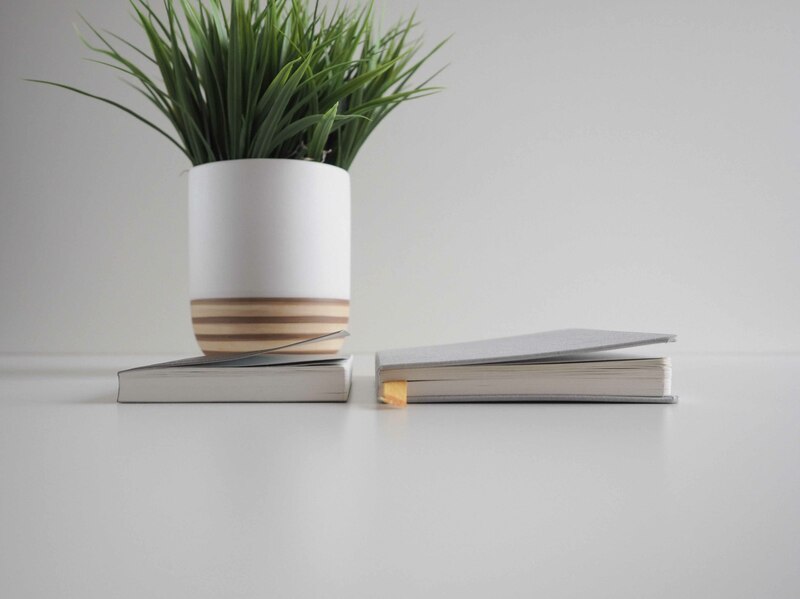 It maintains sharp minds, creates productive bodies, and provides a reflective backdrop for personal growth. All this is good. For me, it’s been the full circle effect that has hit me hardest. Sure, dedicating 15 minutes each day to logging for my 60 year old self may be irksome, but the daily brain activity has helped me sleep better and helped me make more sound and structured decisions than ever before. I couldn’t feel better about that 15 minute investment each day. And a nice side benefit? I get to try out the coolest new pens, papers, and inks in the process. If you haven’t started a personal journal, it’s time to try it out.